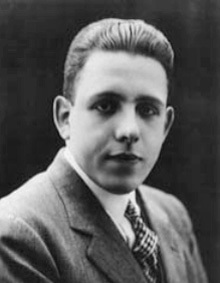 On Friday evening, February 20 starting at 7:30, the Brooklyn Historical Society will host a performance by the Brooklyn Art Song Society of works by the French composer Francis Poulenc (photo) (1899-1963), whose compositions are known for “bright colors, strong, clear rhythms, and gorgeous and novel diatonic harmonies” and who was part of Les Six, a group of composers active in France in the years following World War I. Tickets are $25, $15 student or senior, or $5 for BHS or Green-Wood Cemetery members (to get the member price, email kwilliams@brooklynhistory.org); reserve here. On Sunday, February 22 at 1:00 you can take a history tour, “This is Brooklyn,” in BHS’s historic, landmarked building; it’s free with museum admission (suggested contribution of $10 for adults; $6 for teachers or seniors; free for BHS or G-W members, students with ID, or children under 12). On Sunday at 2:00 there will be a final screening of Diane Paragas’ and Nelson George’s critically acclaimed documentary Brooklyn Boheme. It’s free with museum admission. Later on Sunday, starting at 5:00 there will be a discussion of Branden Jacobs-Jenkins’ play An Octoroon, which won the 2014 Obie Award for Best New American Play. Participating in the discussion will be the playwright, director Sarah Benson, historian Nell Painter, sociologist Ann Morning, and moderator and literary scholar Ayanna Thompson. Admission is free. Update: on Saturday from 11:00 a.m. to noon there will be a family program for parents and kids ages five to ten, “Handmade History! Clues, Collecting, and Collage!” in the BHS classroom. It’s free, but you must reserve tickets here. This weekend is your last chance to see the Heights Players production of Neil Simon’s Fools. Performances are Friday, February 20 and Saturday, February 21 at 8:00 p.m., and a Sunday matinee, February 22 at 2:00 p.m., at the Playhouse, 26 Willow Place. You may make reservations here. Theater 2020’s The Singapore Mikado continues this weekend, with performances Friday and Saturday evenings at 8:00, and a Sunday matinee at 3:00, at St. Charles Borromeo Church, 19 Sidney Place. Get tickets here. Plymouth Church’s Underground Thrift Store concludes its “Stuff a Sack” sale this Sunday from noon to 4:00 p.m. at 65 Hicks Street (between Orange and Cranberry).